In a rare gesture from coaches who ply their trade in the SportPesa Premier League, Gor Mahia coach Hassan Oktay has showered Fifa accredited referee Davies Omweno with praises for manning their game against Bandari in a professional manner. Coming into the match with unanswered questions following a controversial penalty awarded against them when they played Ulinzi Stars on Sunday, Oktay termed Omweno’s calls as spot on and manned the game to the satisfaction of either side. “I laud the referee who oversaw our match against Bandari on Tuesday for he is in a class of his own. Oktay further slammed the referees who manned their league matches against Ulinzi Stars and Kakamega Homeboyz to step up their officiating. We were on the receiving end of poor officiating against Homeboyz and Ulinzi and ended up dropping points. Kenya College of Accountancy (KCA) University coach Charles “Ghost” Goro is convinced his team will survive the Premier League despite a poor start. The students have lost six of their seven matches including back-to-back ties against Emyba and Thunder over the weekend. “We are working hard to reverse the situation and I am sure by the end of the first leg, we will pick up some vital wins.” He said. “Last year, we were in a similar situation and we did well to survive and make the playoffs. The tactician is working with new boys Kevin Oduor and John Ooko to fill the void and the response is promising. Transport Cabinet Secretary James Macharia lied to the nation when he told us BRT buses would be here by February. Just last month, he said 64 buses would be obtained from South Africa. The CS did not even have the courtesy to update us or apologise for being dishonest. Stalled projects are one of the surest ways that guarantee loss of public trust in their management. The city is still congested, making it hard for citizens to forget the unkept promise to reduce the hassle of walking through town. Suppliers say they are frustrated by the government’s failure to pay overdue bills with interest as required by law. Under the Public Procurement and Asset Disposal Act (2015), entities which delay payments to suppliers shall incur additional charges for each day defaulted. “The procuring entity shall pay interest on the overdue amounts… the interest and liquidated damages to be paid shall be in accordance with prevailing mean commercial lending rate as determined by Central Bank of Kenya,” reads Section 140 of the law. Supplies and Contractors Welfare Association chairman Peter Towett said national and county governments have not been honouring payment to suppliers since the 2013/14 financial year when the government functions were officially devolved. “The issue of pending bills became worse when county governments were introduced into the picture because they incorporated structures that were not up to date," Towett said. Untitled players have an opportunity to acquire World Chess Federation (FIDE) title at the Africa Chess Zone 4.2 Individual Championships set for between May 4 and 12 at Shaza Hotel, Mombasa. Chess Kenya (CK) president Bernard Wanjala said the winner of the regional championships will automatically earn the International Master title besides earning a berth to the 2019 World Cup in October in Russia and US$1,000 in prize money. The showpiece has so far attracted 40 players from nine countries including Egypt, Ethiopia, Eritrea, Djibouti, Somalia, Seychelles, Tanzania, Uganda and hosts Kenya. Each zone member country has a quota of five players but Kenya as the hosts can field seven. CK have so far entered four players including Kenya’s current top seed Joseph Methu, who recently won Kenya Open. Whichever the case, the employee must exit their jobs with dignity. As is the case with marriage, labour exits can be messy with full-blown tussles which often turn ugly. In most cases, disgruntled employees leave in a huff and go bad-mouthing their former bosses and companies to win sympathy from people. Remember even founders of these organisations exit but the firms outlive them. So the prudent thing to do is to exit gracefully and wish the company good. In 2016, the Communication Authority of Kenya commissioned British consultancy Analysys Mason to undertake a comprehensive study on the industry. In specific terms, the brief was for the firm to carry out a competition study of the telecommunications sub-sector with a view to evaluating the competitive landscape of the market. The parliamentary committee report stops at prescribing a new study, without providing a rationale or justification for it. There is also mounting concern that parliamentary committee processes, besides the huge taxpayer payload they come with, can potentially be captured, abused and even instrumentalised to achieve a certain end-game. This despite the existence of the Analysys Mason study, whose findings have not been empirically discounted, and which can be a solid, defensible basis for corrective action in the sub-sector. Time to legalise big game hunting? Such ‘big game hunting’ is perfectly legal not just in Tanzania, but also in Zambia, Namibia, Zimbabwe and South Africa – though not in Kenya. I am given to understand that the fact that Kenya does not allow professional big game hunting contributes greatly to the nation’s appeal as a safari destination. Nobody knows for sure what impact a boycott of Kenyan tourism organised by animals’ rights activists would have. But there can be absolutely no doubt that such a boycott would arrive with a vengeance if we were to legalise hunting. If ever there was a subject much in need of “public participation” and new policy, then it is the licensing of recreational hunting in some of the areas surrounding Kenya’s game parks. This comes barely a month after an estimated Sh2 billion, whose authenticity remains suspect, was intercepted by the flying squad at Barclays Bank’s Queensway branch. THEFTUntil the advent and mass adoption of digital technology, bank robberies may not have been as rampant as today. It defeats logic that there was a blatant delay in reporting the ATM heists with the police. In 2017, criminals who stole Sh52 million from the Kenya Commercial Bank’s Thika branch were arrested. The Central Bank’s guidelines on cybercrime recognise that adoption of technology makes banks and customers susceptible to risks. The group responds, “Ilwelwe.”“Lwelwa amarights akho walelwe.” The group responds, “Walwelwe.”“Izwe.” The group responds, “Elethu.”“Umhlaba?” The group responds, “Owethu.”“Izindlu ? The group responds, “Ezethu.”“Amasela? 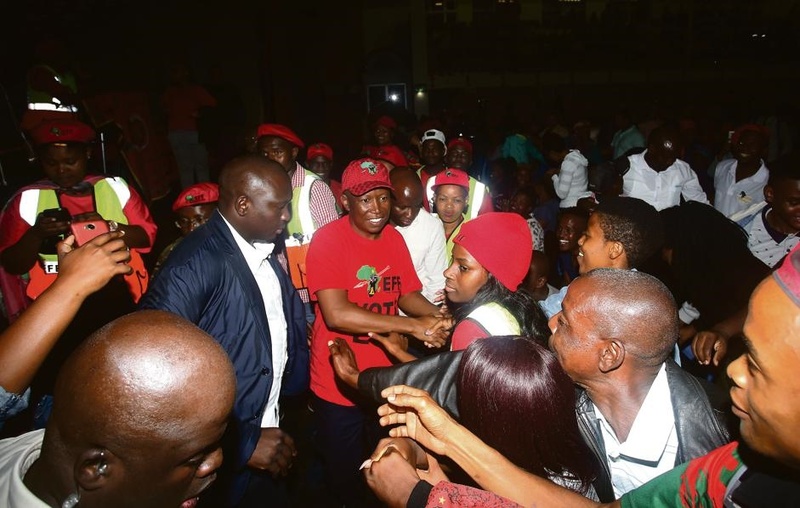 The group responds, “Awahambe.”Student support in KwaZulu-Natal has been crucial to the growth of the EFF, starting with what was a historic win at the University of Zululand. "At the centre of that growth is young people; it is the students who are very energetic. While students seem to love the EFF, this support does not always translate to votes. By EDITORIALMore by this AuthorFor well over a year now, Nairobi City County has been operating without a substantive office. However, Governor Mike Sonko does not seem bothered about the fact that he has not had a deputy for all that time, most likely because that situation suits him. Worse, he has been gloating over it and has even had the cheek to tell the Senate Devolution Committee that the appointment of his deputy is a non-issue. NECESSITYThe office of the deputy governor is a constitutional position, whose holder is a principal assistant to the governor, having been the running mate in the election. This then is an issue that should be addressed in the constitutional referendum that has been mooted. By EDITORIALMore by this AuthorThe Kenya National Union of Teachers’ stand on the ongoing training of its members on the new curriculum is ill-advised. For sure, the implementation of the curriculum has widely been contested because correct processes were not followed. Ideally, Education ministry was expected to publish a Sessional Paper through a consultative process and present that to Parliament for legislative approval. However, since January, the government has been implementing the curriculum in grades one to three, followed by grade four next year. TRAININGIt’s against the backdrop of the shortcomings that the Education ministry is mounting teacher training across the country. 149 titles issued to Kamiti Amner Land owners, IllegalLands CS Faridah Karoney. According to the Ministry of Lands, the 419-acre parcel from which 300 acres were hived off to settle squatters after a Government decree was still public forest land. SEE ALSO :MPs- We won’t allow KQ to takeover JKIA“The 149 titled parcels fall within the boundaries of the Kamiti Forest Reserve. “Any interested party may petition Parliament for the variation of boundaries of a public forest or the revocation of the registration of a public forest or a portion of a public forest. The five groups, Kamiti Forest Squatters Association, Muungano wa Kamiti Group and Kamiti Anmer Development Welfare Group, Kenya Forest Service and Kamiti Development Association are using alternative Dispute Resolution Mechanism to benefit from the land. By any means, this is a solid development agenda for China and to a great extent, the rest of the world. For Kenya, the devil is in the details: Kenya’s growth prospects seem at variance with China's frenetic rush to conquer the world. Tragedy is that borrowing to repay a loan means entrapment that worsens as the country burrows deeper into debt. But while loans have grown rapidly, taxes have lagged behind. We are now in a situation where we will start spending Sh1 trillion to repay loans; the equivalent of taxes collected by the Kenya Revenue Authority in nine months.